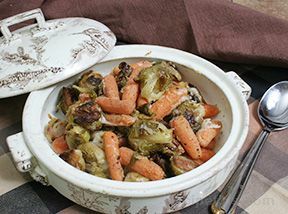 The distinctive flavor of sage livens the taste of buttery Brussels sprouts in this simple preparation. 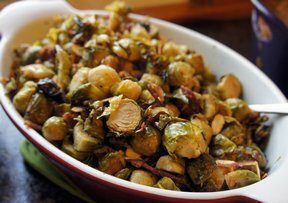 After trimming the stems of the washed Brussels sprouts, peel away some of the outer leaves and place them in a large bowl of cold water. Cut the rest of the Brussels sprouts in half and add them to the water as well. 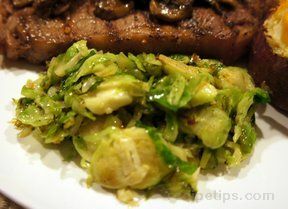 Transfer the sprouts to a large skillet with one cup of cold water. Bring to a boil, cover and reduce the heat to low and cook until tender, 10-15 minutes. Wipe the pan dry and add butter, oil and sage. Cook over medium heat until the oil and butter are infused with the sage, 3-5 minutes. Do not brown the sage. 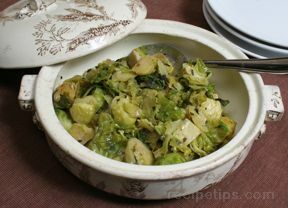 Add the Brussels sprouts, salt and pepper to the oil and toss to combine until the sprouts are coated.